Google tag manager is a free solution that allows digital marketers to optimize, enhance, track and improve a website's functionality. A marketer can concentrate on marketing rather than the technology because it allows the user to update, add and manage tags without having to edit the code or slowing down the website with third party tags. It is free, very easy to set up and use. The marketer just needs a few clicks to add a tag and doesn't need to wait for prolonged periods waiting for the codes to be updated. 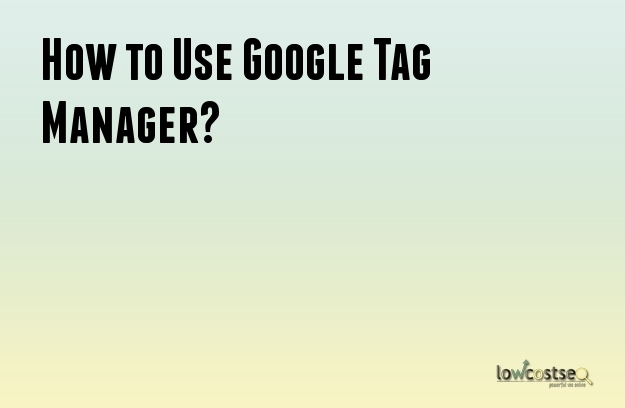 How do you set up and start using Google tag manager. 1) Start by visiting www.google.com/tag manager to sign up. From the account you can be able to add more accounts from the 'account list'. Next create a container which will hold tags for a particular website. You can also add new containers by clicking on 'new container'. 2) After creating a container, you can now start adding tags. To add tags, go to the tag section and choose the 'add tag' button. This will take you to the tag page. From here you can choose to either use the tag templates provided by Google or by use customized tags according to your preferred specifications. Choosing the templates is advisable because it minimizes errors. Once through, you will be asked to add a few details regarding the tags like conversion ID and label for Adwords, cookie path, Track type etc. You can also 'add rule to fire' that will specify the conditions under which the tag will be fired. 3) Once you add the tags to the containers, you must manually publish them because they are not automatically added or updated. Once you publish your tag, it will be linked to a container version found on the left navigation menu that has numbers. Once you click on the 'versions', it will take you to a page with a summarized report of the tags and the rules applying to them. 4) Users are added to accounts and access and rights privileges are assigned to different users as follows. 'No access' mean the account is not available to the user, 'View only' means that the user is not allowed to edit the account, 'view and edit' means that a user has the right to update the account, 'view edit delete and publish' means that the user can amend and choose what goes live on the website. This enhances the security of your site. Google tag manager is a great online resource that allows online businesses to easily and quickly add and update tags without having to involve webmasters. The removal of the need to access the codes reduces the chances of a bug appearing on your website. As programming codes are sensitive and tedious to amend when not maintained conscientiously, it is advisable to avoid editing the raw file, unless done by experienced webmasters who are familiar with the code structure. Once again, Google has introduced a valuable tool to help its users with their website needs.